Chalam is a yesteryear actor played versatile roles in Telugu film industry as a hero, comedian, character actor, producer,art director, and set director. 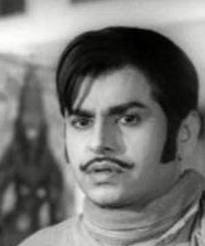 He acted between 1950s and 1980s and was considered as a Andhra Dilip Kumar. He produced and acted in super hit movies such as Sambarala Rambabu in 1970, Mattilo Manikyam in 1971.He was a very close friend of fellow Telugu actors Shoban Babu and Chandra Mohan. Chalam married Urvasi Sharada who was a co-star in her debut film Tandrulu Kodukulu. They were divorced later on. Sambarala Rambabu in Telugu in 1970. Mattilo Manikyam in Telugu in 1971. Chand Par Chadayee in Hindi in 1967. Sridevi in Telugu in 1970. Yugandhar in Telugu in 1979. Gereftar in Hindi in 1985.